Eating cabbage has huge health benefits particularly in cancer prevention because cabbage is loaded with phytonutrient antioxidants. Cabbage (in addition to other vegetables in the cruciferous family cauliflower, Brussels sprouts, broccoli, bok choy, collards and kale) is rich in the phytonutrient antioxidant called glucosinolate. When consumed, the glucosinolates found in cabbage can be converted into isothiocyanate compounds that are cancer preventive for a variety of different cancers. You’ll want to include cabbage as one of the cruciferous vegetables you eat on a regular basis if you want to receive the fantastic health benefits provided by the cruciferous vegetable family. But do try to eat it as raw as you can. Some studies demonstrate that cooked cabbage fails to provide benefits. 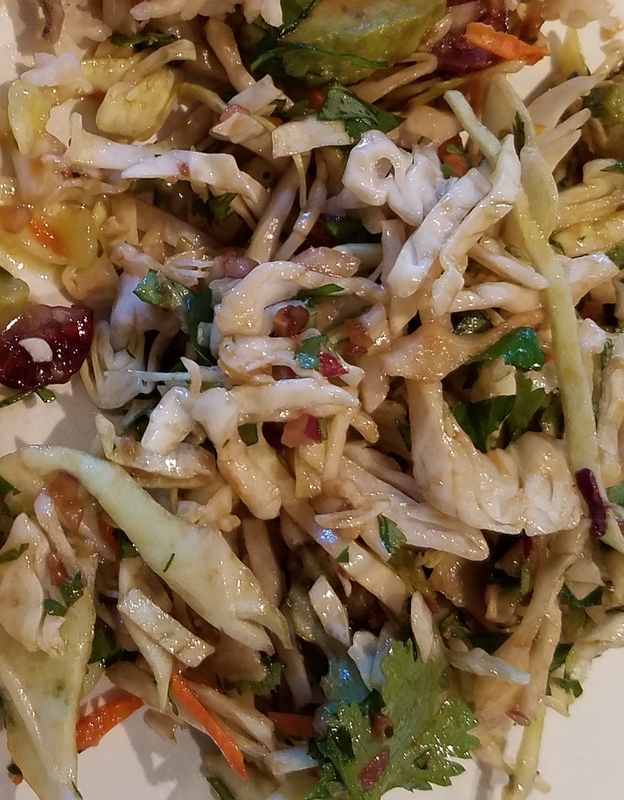 One of my favorite ways to eat cabbage is sliced thinly in salads like coleslaw. 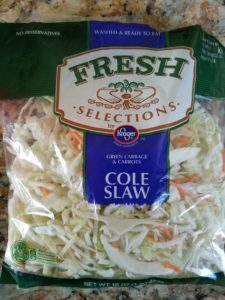 Unfortunately classic coleslaw is high in fat. The healthier alternative to mayo-laden coleslaw is Asian Slaw. I’ve developed this particular version over the last few months and it has become a favorite. This is a great salad to have on hand in the refrigerator. The entire salad does not need to be eaten at once. It lasts for a couple days in the refrigerator. I’ve included parsley in my recipe because of the beautiful color and the nutrients that it adds. Parsley is rich in many antioxidant vitamins, including vitamin-A, beta-carotene, vitamin-C, vitamin-E, zeaxanthin and lutein (both help prevent age-related macular degeneration), and cryptoxanthin (which is converted to Vitamin A and acts as an antioxidant). The herb is also one of the best sources of vitamin-K (a potent bone builder and heart protector) and folates. Carrots are a nice addition for their sweetness, bright color and the nutrients they add, especially the cancer preventative carotenoids with their important antioxidant benefits. Carrots rank high on the list of antioxidant vegetables in terms of their carotenoids. In addition to all the cancer preventative nutrients cabbage has, one cup of cabbage has only 20 calories. And each one-cup serving of raw cabbage contains 43% percent of your recommended daily value of vitamin C and a huge 66% DV for vitamin K.
To make the preparation easier I recommend the use of a mandoline to slice the cabbage. The Swissmar Borner V Power Mandoline, V-7000, White gets rave reviews. And if you don’t want to slice it yourself, substitute with pre-made coleslaw bagged salad. You’ll want to store your slaw in glass containers instead of plastic ones. Research suggests that all plastics may leach chemicals such as bisphenol A (BPA), may cause cancer, weight gain Insulin Resistance. BPA is a weak synthetic estrogen found in many plastic products. Its estrogen-like activity makes it a hormone disruptor that can affect how estrogen and other hormones act in the body, by blocking them or mimicking them, which throws off the body’s hormonal balance. I like the Pyrex 6022369 Storage 14-Piece Round Set, Clear with Blue Lids set. Combine the dressing ingredients in a glass jar and shake to blend. Refrigerate to allow the flavors to blend for several hours. Meanwhile combine vegetables except pumpkin seeds in a large bowl, cover and refrigerate. When ready to serve pour entire bottle of dressing over salad and toss. Top each serving with roasted pumpkin seeds. This is my lunch of leftovers from last night’s dinner. It was so easy to make! I stirred together fajitas, boiled water and added rice, steamed asparagus, and opened a can of black beans and tossed some frozen corn in then microwaved. Fajitas (no tortilla) made with 3 cubed chicken breast halves, 1 large sliced onion and 2 sliced red peppers with an envelope of Fajita seasoning and water. If you’re trying to reduce sodium, use less of the seasoning packet. Trader Joe’s Roasted Corn (frozen product) that I added to a can of black beans. High protein from the chicken, and mix of whole grain rice, quinoa, black beans and corn. All carbohydrates are nutritious whole grains and beans. High volume: This is very filling but relatively low calorie. 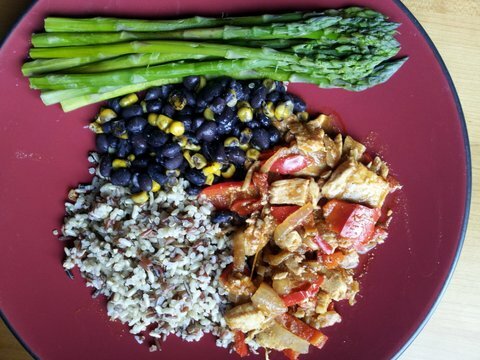 Many antioxidant* rich foods: asparagus, corn, red pepper, black bean, onion, quinoa. High fiber from all the whole grains and vegetables. And it is really delicious. I’m happy that all I had to do today for lunch was reheat in the microwave. *Antioxidants protect your cells against the effects of free radicals. Free radicals are molecules produced when your body breaks down food, or by environmental exposures like tobacco smoke and radiation. Free radicals can damage cells, and may play a role in heart disease, cancer and other diseases. The World Health Organization’s International Agency for Research on cancer has now moved tanning beds into its top cancer risk category. They are on believed to be as deadly as arsenic, mustard gas, and tobacco. The new classification also puts them in the list of definite causes of cancer, alongside tobacco, the hepatitis B virus and chimney sweeping, among others. The researchers’ analysis of more than twenty studies, recently published in the medical journal Lancet Oncology, found that all type of UV radiation, A, B and C cause mutations in mice. This is proof that the radiation is carcinogenic. Previously, only one type of ultraviolet radiation was thought to be lethal. The analysis concluded that the risk of melanoma increases by 75% when tanning bed use begins before age 30. The safest way to get a beautiful glow? Use self-tanner or professional spray tans such as Fantasy Tan.